As demolition day draw nears for the Asbestos ridden, brown brick, yellow bottle glass, mission brown timber trim home of ours on Riddle St., melancholy has set in. As ugly, unsafe and unsuited as she is, the existing building on the block safely sheltered us for nearly 2 years and arguably has born witness to many more significant life events of its residents past. I wanted to acknowledge that shelter and in as least woo woo way as possible say goodbye and thanks. So this morning we did a range of things that will help us hold those memories as we move into the next chapter at Riddle st.
Take cuttings of plants and transplant what you can. Whilst we did little to the yard knowing that we would soon be moving out I have always been a collector of sad plants and neighbours cuttings and overtime had a little succulent garden and some natives growing well. So we had a great time digging up and taking away what we could and I am heading back tomorrow with fella in tow to see if I can successfully take cuttings of a large cabbage tree that abuts the home and can’t be saved or re-used. Demolition dudes are not the gentlest of creatures so Miss A and I took great delight in marking those trees that were to be kept and creating barricades around them. 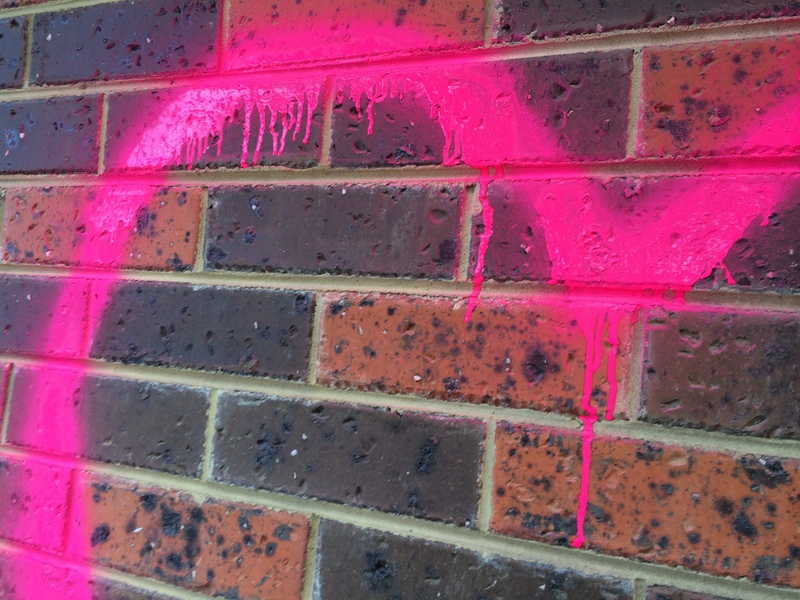 Luckily our line marking paint is pink and thankfully it will degrade over time more quickly than other paints. Only to be subsequently told that an x marks the trees that are going (not staying as I thought). i’ll be back there later today wrapping them in warning tape and best be on site to make sure no mistakes are made! Smudge it, if you can. Well this is where things got interesting. Having grown up in the Kimberley and in particular having had the great fortune to visit a number of more remote Indigenous communities I have witnessed the role that ‘smoking’ plays in maintenance of culture. Native plants are scorched til they smoke, each having specific properties and intent and then are applied to both people and places to heal, to forgive and to cleanse. I have a limited knowledge of ethno-botany and its applications, so instead I gathered randomly from all the native plants that I cannot save on our site. 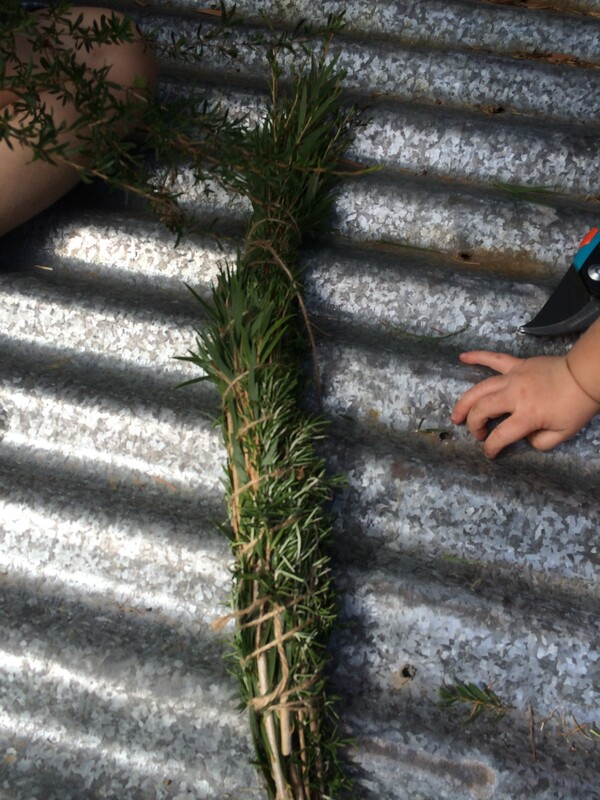 I bound their leaves with the random addition of a dogged rosemary bush that is refusing to die (I think I’ll go back and rescue it too). I’ll post separately about the how to of this process but needless to say the girls had a great time getting to ‘play’ with fire and smoke and gasp, do it inside! Super naughty. 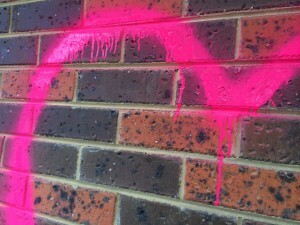 Whilst Banksy’s job is safe, Miss A and I had great delight in embracing our inner vandal. We scattered pink spots and stripes across old gates, fences, the grass that will go and the odds and sods to be demolished. 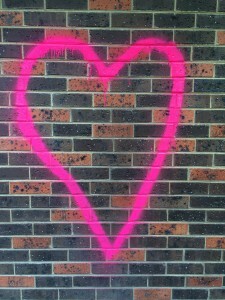 We topped it off with a lovely love heart. Which is when I spotted our visitor.Find meaning. In the end, all of this was about searching for meaning in buildings and the cycle of demolition, destruction, construction and occupation of space and structures. (Excuse the woo woo). 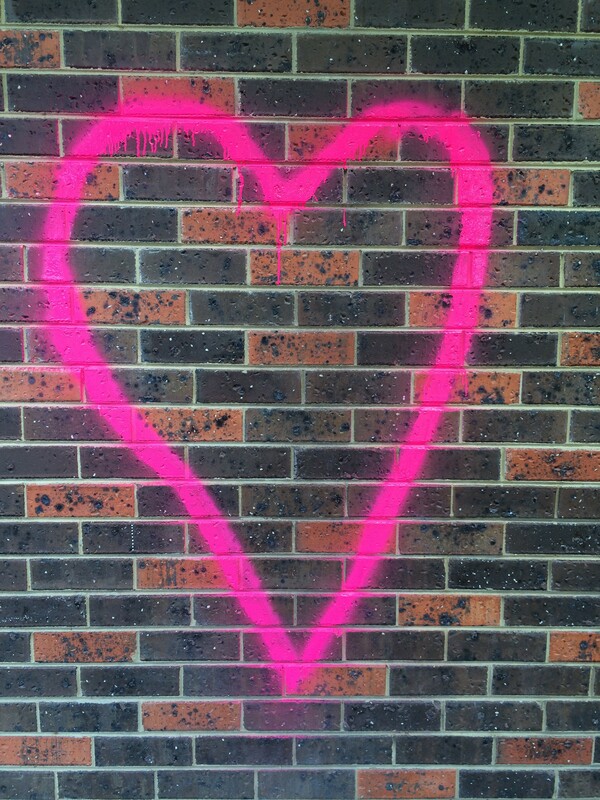 I had already piled the kids into the car and was applying a final hot pink love heart, when I spotted something on the brick wall. It would have been very easy to miss, so I kind of think it was meant for me. A dragonfly. Alive but very still and it allowed me to come pretty close. It wasn’t one of the iridescent blue ones that I am used to from the Kimberley, it was shades of mission brown, just like the house that was about to be torn down. Now in the Kimberley, Dragonflies have specific and special meaning. Particularly in Indigenous culture but even for the white fellas they mean a change of seasons. They arrive in about April at the cessation of the wet and start of the dry, which kind of happens like flicking a switch and swathes of dragonflies arrive. 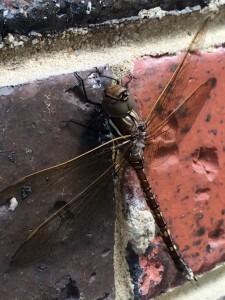 I am not sure of its specific meanings in Indigenous culture and I wouldn’t appropriate them anyway but for me a dragonfly in many ways represents a tricking of the senses and most specifically change, it teaches us that nothing is quite the way it seems. If a dragonfly appears, for me it means change is imminent and we are being visited with a message, perhaps to embrace that change. In the end that was all the goodbye and blessing I needed. It was like a message from that woo woo place that all would be ok and that somehow the change from old home to new, is blessed.